We discuss the simplified likelihood framework as a systematic approximation scheme for experimental likelihoods such as those originating from LHC experiments. We develop the simplified likelihood from the Central Limit Theorem keeping the next-to-leading term in the large N expansion to correctly account for asymmetries. Moreover, we present an efficient method to compute the parameters of the simplified likelihood from Monte Carlo simulations. The approach is validated using a realistic LHC-like analysis, and the limits of the approximation are explored. Finally, we discuss how the simplified likelihood data can be conveniently released in the HepData error source format and automatically built from it, making this framework a convenient tool to transmit realistic experimental likelihoods to the community. S. Fichet, Taming systematic uncertainties at the LHC with the central limit theorem, Nucl. Phys. B 911 (2016) 623 [arXiv:1603.03061] [INSPIRE]. CMS collaboration¡/a¿, Simplified likelihood for the re-interpretation of public CMS results, CMS-NOTE-2017-001 (Simplified likelihood for the re-interpretation of public CMS results). S. Kraml et al., Searches for New Physics: Les Houches Recommendations for the Presentation of LHC Results, Eur. Phys. J. C 72 (2012) 1976 [arXiv:1203.2489] [INSPIRE]. F. Boudjema et al., On the presentation of the LHC Higgs Results, arXiv:1307.5865 [INSPIRE]. W. Verkerke and D.P. Kirkby, The RooFit toolkit for data modeling, eConf C 0303241 (2003) MOLT007 [physics/0306116] [INSPIRE]. L. Moneta et al., The RooStats Project, PoS(ACAT2010)057 (2010) [arXiv:1009.1003] [INSPIRE]. K. Cranmer, S. Kreiss, D. Lopez-Val and T. Plehn, Decoupling Theoretical Uncertainties from Measurements of the Higgs Boson, Phys. Rev. D 91 (2015) 054032 [arXiv:1401.0080] [INSPIRE]. 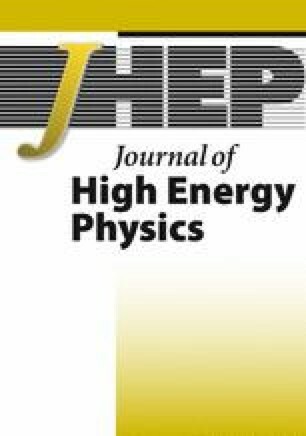 E. Maguire, L. Heinrich and G. Watt, HEPData: a repository for high energy physics data, J. Phys. Conf. Ser. 898 (2017) 102006 [arXiv:1704.05473] [INSPIRE]. L. Lyons and N. Wardle, Statistical issues in searches for new phenomena in High Energy Physics, J. Phys. G 45 (2018) 033001 [INSPIRE]. ATLAS and CMS collaborations and The LHC Higgs Combination Group, Procedure for the LHC Higgs boson search combination in Summer 2011, ATL-PHYS-PUB-2011-011 (2011). G. Cowan, K. Cranmer, E. Gross and O. Vitells, Asymptotic formulae for likelihood-based tests of new physics, Eur. Phys. J. C 71 (2011) 1554 [Erratum ibid. C 73 (2013) 2501] [arXiv:1007.1727] [INSPIRE]. 1.School of Physics & AstronomyUniversity of GlasgowGlasgowU.K. 3.Walter Burke Institute for Theoretical Physics, California Institute of TechnologyPasadenaU.S.A.